The ingenious design of double pull mechanism means the inner wrap provides the best possible compression, heat retention and comfort, whilst the unique extra strength elastic strap would give you the extra shield of stability and support. 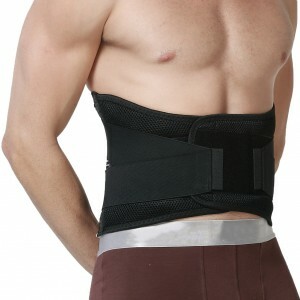 It has a unique criss-cross elastic strap which is effective in removing excess gap between the neoprene and your body, to enhance stability. The support provided by the compression strap improves posture to aid treatment of back problems such as a slipped disc, degenerative disc disease and Sciatica. The warmth provided by the high quality neoprene can help to ease back muscle spasms and low back pain associated with a herniated disc and spinal stenosis. XL: For belly circumference of 102-113cm (40-44.5"). XXL: For belly circumference of 113-125cm (44.5-49").